This is my personal story of suffering for decades from undiagnosed cough variant asthma. Yoga practice has been the key to manage the frequency and duration of my asthmatic episodes. The year is 1984, a time when many yuppies were operating in full career mode. Waiting at the dais, I am poised to lead an important and politically loaded presentation to my employers, a college board. Of course I’m “dressed for success”, as defined in the 1980s. Along with my notes, I clutch a plastic bag of cough drops as I approach the podium. I know that the only way I will be able to complete a sentence is if there is a trusty lozenge in my mouth. I sucked these cough drops the entire talk; when one dissolved, I popped in the next. It’s a wonder that the presentation went well; even though I bloopered “excuse me while I DRINK another cough drop”! Navigating presentations, counseling sessions, conversations with undiagnosed asthma depended on these two friends. Of course I still need them but not to the extent; not even close. And I love tea! Tacky, to say the least! My presentation cough drop crutch is one in a long series of frustrating adaptations for a regularly occurring, undiagnosed, dry hacking cough. I needed to create these workarounds in order to function for the first three decades of my life. My bag-o-menthol was my special partner for this particularly high profile speech. I grew up in Chicago. Winters are gray, snowy, and dark. Winter also brings the cold season. And then… spring finally arrives. Along with the change of seasons comes: hay fever. My dreaded cough manifested itself like clockwork. Following those inevitable winter common colds, or a bout of spring hay fever, the hacking would begin. No, my colds didn’t simply subside. Instead, they would “gift” me with a cough that would last 6-8 weeks, long after the cold was gone. The symptoms began in junior high school. I tunneled under the covers of my bed so as to not to wake my family. Still, I would be coughing, and sometimes weeping with frustration. A visit to the family physician resulted in the foulest tasting prescription grade “cough syrup” one could imagine. And it did nothing for the cough. Fast forward to undergraduate school at the University of Illinois in Champaign. I rode my bicycle everywhere. And of course Champaign in central Illinois was VERY cold in the winter. A particularly awful coughing episode sticks in my mind; I recall sore abdominal muscles as I pedaled to classes on my bike. Nowadays we might deem this a great deep core workout! But it was pain. Soreness induced by the unrelenting muscular contractions of the cough, and the effort of attempting to suppress it. On an icy morning, completely bundled up with a knitted muffler on my face, I pedaled several miles to the student health center. This time, my lungs were x-rayed. Nothing was found and another prescription was provided for more foul “cough syrup”. Sleep deprivation along with pain, anxiety, fear and depression came with this cough. After a particularly horrible night, I consulted the yellow pages (yes, the actual book) and called ear, nose and throat specialists until someone answered. I had the brainstorm in the middle of the night that I should try another kind of physician. This physician diagnosed a secondary ear infection and a deviated septum. Did I have my answer? Well antibiotics for the ear infection certainly helped me sleep better. But…the cough did not abate. Once morning had broken (to quote one of my favorite singer/songwriters of all time: Cat Stevens) the cough reared it’s ugly little head again. 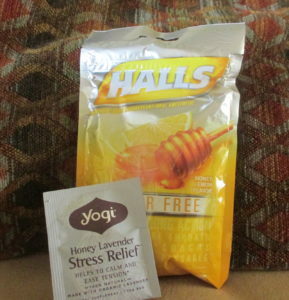 Cough drops…hot tea…urgent care clinics, episode upon pitiful episode of no relief; for decades. Finally, I consulted with an allergist and received a full work-up; patch tests and all. Inhalers did eventually help the cough episodes, and I am deeply and utterly grateful for the diagnosis and treatment. Then about 12 years ago my Yoga practice shifted from sporadic to genuinely committed. I began participating with an on-line group of like minded yoginis from literally around the U.S and the world, discussing our practices, our readings, and checking-in with one another about our deepening insights and discoveries. We also often met “in real life” taking immersions with Felicity Green, Erich Schiffmann, Manuso Manos, and others. I also began attending Iyengar and Iyengar-inspired classes in Tucson. Of course like any good yogini, I built my yoga library. Arms placed in “cactus pose” is an option for further chest opening. One of the asanas (poses) that manages stress and brings my cough variant asthma relief. At this time period I acquired “Yoga: The Path to Holistic Health” by BKS Iyengar. During one of my asthma episodes, I referenced this volume and decided to try the sequence provided in this beautiful book. The series, which began with an introduction stating “asthma is usually caused by allergies or stress” (yes that’s me!) gave me a path to a new approach. So I gave it a go. With the book open in front of me in my living room, I began with the seated poses such as staff, cobblers, wide angle seated pose and heroes pose, and then progressed to reclined propped versions of those poses: bound angle, heros and supported bridge pose. From there I move to downdog, mountain pose with arm variations and half moon. I substituted heavily propped (I just did not have all of the supports depicted in the book) staff and camel poses with supported bridge and a chest opening savasana. After this first practice, I IMMEDIATELY felt better. My stress was relieved and my coughing noticeably abated. This instant relief was motivation to continue with Mr. Iyengar’s specific sequence (and my own adaptations) during acute episodes. Furthermore, my committed well-rounded practice always included focus on my posture; particularly side body and chest openers like bridge on a block, sphinx, warrior 2 and shoulder openers with a strap. I noticed that when I would suffer from the cough variant asthma symptoms, the episodes became much shorter. I firmly attest that my asana practice helped to slowly and incrementally, open the tissues around the lungs and chest so I could breathe better. The apprehensive anxiety that would come from the anticipation of another cough became managed with my practice. 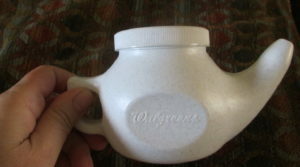 I learned to calm myself with basic pranayama and relaxation along with asana..
Neti pots are mainstream (so to speak…). Even the corner drugstore stocks them. Unusual when first attempting; worth acclimating yourself to the sensation; and relief! Additionally, about 5 years ago when symptoms would arise, I started using a neti pot. I know that helps immensely. Now, even though the coughing is an issue, it is minor. I discern exactly what to do for myself, and the duration and concomitant stress is completely manageable and short. I feel deep gratitude for the practice of yoga and to all of my teachers. My quality of life has improved in many ways, but particularly how yoga has addressed the frequency and severity of cough variant asthma. Yoga has been a magnificent gift. By Bonnie J. Golden, M.Ed, e-RYT. A version of this article was originally published on the Yoga for Healthy Aging Blog. Bonnie recently became certified as a Yoga for Healthy Aging instructor. Visit here for full class schedule including upcoming Yoga for Healthy Aging workshops.